I wanted to share a great blog post from the Simply Luxurious Blog – one of my favorite blogs that always speaks to my heart. Something that is on all of our minds is learning to be comfortable with who we are. Our own genuine authenticity is something we aspire to, but why does it seem so difficult to so many? Why do we bend so easily and compromise our own thoughts and feelings because we feel insecure to speak our mind? Why is it so easy to want to be someone else, to not love and appreciate our own uniqueness? 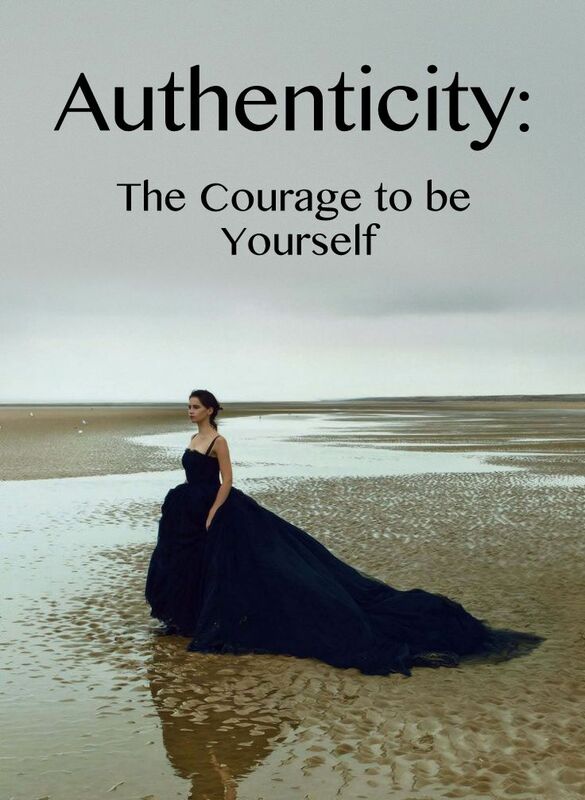 I agree wholeheartedly that being authentic takes courage! I hope you enjoy this post as well as I did. Authenticity. A lofty aspiration that when we consider what it is, being true to who we are, should be something quite simple. After all, who can know who we are at our core better than ourselves? But in fact, it is hard. In a world of doctored reality television, plastic surgery and social media pages that allow us the opportunity to only put our best selves online, when we dare to show ourselves, flaws, strengths and all, it can be daunting. While we know we’re not perfect, embracing and coming to terms with our weaknesses isn’t easy. Tapping into our authentic selves is a never-ending process as we are always learning something new if we are allowing ourselves the endless opportunities the world presents to progress and grow. However, once we accept that it won’t be easy, and that we are not alone in feeling a bit unnerved by allowing our true selves to be exposed for better or for worse, the beautiful benefits are unmatched and well worth facing these fears. So today we’re going to dive into what exactly being authentic is, define it, and share the priceless benefits available once we choose this path as the journey we wish our lives to travel upon. a clear understanding of who you are, why you feel certain emotions at certain times, an understanding of your preferences for things as simple as favorite meals to something as complicated as what prompts you to feel anxiety or stress, understanding what you are passionate about and why. When we know ourselves, our abilities and tastes as well as understand our innate abilities, the skills we have built over time, as well as our weaknesses, we are self-aware. Once you know what your strengths and weaknesses are, you can effectively utilize them and/or work through them so that they don’t become your Achilles’ heel, but rather opportunities to move you forward successfully. While basic understanding of how to utilize or improve a strength or a weakness may be something you learn immediately, in other scenarios, you may want to seek guidance – whether it be from a family member, therapist or expert whose advice and guidance you respect. Other options are simply educating yourself – reading a variety of books, taking courses, journaling to make sense of what you are actually feeling, etc. When you know how to tap into and make the most of your gifts, as well as work through your weaknesses, improving them, you take control of your life. Upon understanding yourself, you can more clearly discern what you can and cannot compromise on. Decision making will become much easier as each scenario of options presents itself. Saying “no” will come without hesitation or be followed by guilt, and “yes” will come more freely and excitedly. In order to have healthy relationships, you must be willing to be authentic. And in order to present your true self to those you are building relationships with, you must be vulnerable. Because it is when you are vulnerable that you discover who will recognize and thoughtfully appreciate your vulnerability, and respond in kind, which allows the relationship to grow. It is with vulnerability, being open and honest, as Brené Brown reminds us in Daring Greatly, that can build strong, intimate relationships. When we talk about investing in authenticity, the benefits far outweigh the initial trepidation. Overall, it is the quality of your life that will improve, and isn’t that the basic premise for trying to reform anything in our lives? When you know that the decisions you are making are in alignment with your values and needs, you don’t have to think twice about it. While there may be others observing your decisions who are uncertain of why you’ve chosen a particular direction which may be understandable. After all, they don’t know everything that you hold dear. However, you will move forward with confidence knowing it is indeed your best move. And when you let go of the second-guessing, you set yourself free. Free from unnecessary worry, angst and stress. Brené Brown reminds us that, “If you feel good about the life path you are following, you will have no interest to judge others choices.” And so when we look at this quote from both perspectives, the doer sets herself free, and the judger has revealed their cards. Those who judge are often either consciously or subconsciously frustrated with the life path they are, so it is in their judgment of us that they reveal their own truths. And while we don’t need to mope or feel sorry for them, we can have compassion and understanding because most of us at some point in our lives will have find ourselves not quite where we want to be. And if we look at others’ judgment in this light, it no longer has to hold us back. “Vulnerability is what breeds opportunity.” In order to connect with others we must be able to share ourselves. Now by no means does this require that you reveal all. In fact, I would advise against such a revelation, but little by little you give and see if they give. You give again if they followed in kind and so on and so forth. And it’s a process. It takes time. But in that process is where that trust is built. It’s where that respect begins to grow. Putting ourselves out there, sharing what we are passionate about, as discussed in great length in The Simple Sophisticate‘s fifth podcast, can reap many rewards, but one of which is a boost to our confidence. Regardless of the response from others, we show ourselves that we can do something we initially thought we could not, and that is cataloged in our memory to draw upon in the next instance in which we doubt ourselves. And while we are the beneficiaries of this boost, we also provide a benefit to others. How? While there will be an array of feedback – praise and critiques – often it is in simply taking this risk that you draw applause from those who have traveled your path and know the difficulty as well as those who hope to someday do what you’ve done. And so by finding the courage to be authentic, you not only enjoy the benefits but you help others along their journey as well. At the core for nearly all of us, we are trying to figure out our gifts, our path, what we can do that makes us unique or special. Guess what? The only way to discover this is to be authentic. I know you’re not surprised by this, but in choosing such a path, we are choosing uncertainty, and understandably, that is what holds us back at times. Fight through this. The treasure of your full potential is your reward. Once we let go of what others’ think as well as the bad habit of second-guessing ourselves, we let go of unnecessary stress and anxiety. Once we refuse to over-analyze, we aren’t bringing into our daily lives stress that can gradually erode our health. Instead, our peace-of-mind grows and effectively our health improves as well. Consequentially, our productivity and the quality of our lives improves, which was the initial goal from the get-go. So if we want the success, the contentment, the happiness that we seek, we must muster up the necessary courage do what comes naturally, being ourselves.